I’m sure a lot of people take this literally and do their best to never lose money ever. That, of course, is the wrong way to approach it. So it helps to not take Buffett so literally, in this case. While no one wishes to incur losses, you couldn’t prove it from an examination of the behavior of most investors and speculators. The speculative urge that lies within most of us is strong; the prospect of a free lunch can be compelling, especially when others have already seemingly partaken. It can be hard to concentrate on potential losses while others are greedily reaching for gains and your broker is on the phone offering shares in the latest “hot” initial public offering. Yet the avoidance of loss is the surest way to ensure a profitable outcome. There is an element of truth to this notion; stocks do figure to outperform bonds and cash over the years. Being junior in a company’s capital structure and lacking contractual cash flows and maturity dates, equities are inherently riskier than debt instruments… To persuade investors to venture into equities rather than safer debt instruments, they must be enticed by the prospect of higher returns. However…the actual risk of a particular investment cannot be determined from historical data. It depends on the price paid. If enough investors believe the argument that equities will offer the best long-term returns, they may pour money into stocks, bidding prices up to levels at which they no longer offer the superior returns. The risk of loss stemming from equity’s place in the capital structure is exacerbated by paying a higher price. Another common belief is that risk avoidance is incompatible with investment success. This view holds that high return is attainable only by incurring high risk and that long-term investment success is attainable only by seeking out and bearing, rather than avoiding, risk. Why do I believe, conversely, that risk avoidance is the single most important element of an investment program? If you had $1,000, would you be willing to wager it, double or nothing, on a fair coin toss? Probably not. Would you risk your entire net worth on such a gamble? Of course not. Would you risk the loss of, say, 30 percent of your net worth for an equivalent gain? Not many people would because the loss of a substantial amount of money could impair their standard of living while a comparable gain might not improve it commensurately. If you are one of the vast majority of investors who are risk averse, then loss avoidance must be the cornerstone of your investment philosophy. Greedy, short-term-oriented investors may lose sight of a sound mathematical reason for avoiding loss: the effects of compounding even moderate returns over many years are compelling, if not downright mind boggling… Perseverance at even relatively modest rates of return is of the utmost importance in compounding your net worth. A corollary to the importance of compounding is that it is very difficult to recover from even one large loss, which could literally destroy all at once the beneficial effects of many years of investment success. In other words, an investor is more likely to do well by achieving consistently good returns with limited downside risk than by achieving volatile and sometimes even spectacular gains but with considerable risk of principal. Losing is part of winning in the long term. It’s part of the process. What is not part of winning in the long run, is taking an unnecessary risk that leads to a devastating loss. The failure of LTCM is the perfect example. The lesson from LTCM is that all it takes is one big loss to wipe you out. Investing requires us to deal with the future. If the future were knowable by all, investing wouldn’t be very challenging (or, consequently, very profitable). Because it’s not, my final key theme surrounds the importance of understanding uncertainty. 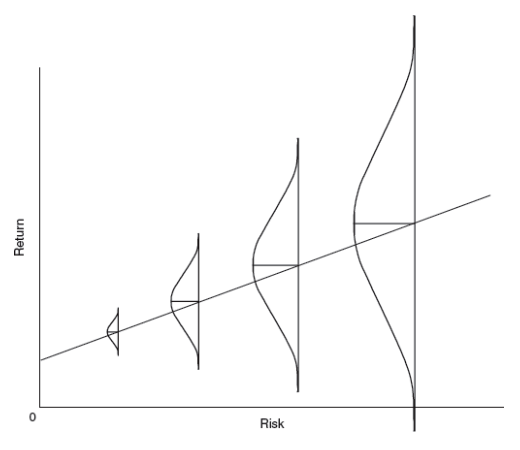 The graphic…illustrates the essence of “riskier” investments. This isn’t an abstraction; riskier investments involve greater uncertainty regarding the outcome, as well as the increased likelihood of some painful ones. As Klarman alluded to, behavior often works against investors. Over-optimism and overconfidence make it easy for investors to see things through rose-colored glasses. When the perception of risk is clouded over, investors are blind to the many possible downsides. That makes it easy to see any price as cheap and take on more risk than they can handle. With LTCM, overconfidence in the model led to their demise. They failed to account for the unpredictability of the future that makes all strategies imperfect (especially those using huge amounts of leverage). Buffett (and Klarman and Marks) is saying that if a massive loss is possible, it’s simply not worth taking the risk.